Am I suffering from a high-ankle sprain? | Podiatry Associates, P.C. Am I suffering from a high-ankle sprain? Welcome to Our Website-Understanding Foot and Ankle Pain If you are experiencing ankle pain or problems with your feet, you have come to the right place for information and for help getting you back on your feet. 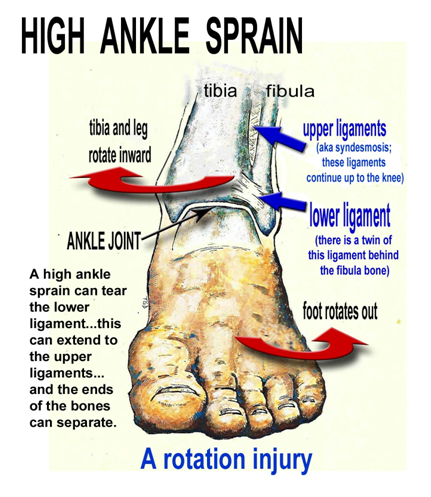 A high ankle sprain involves your anterior tibiofibular ligament and can be very painful. While this is not the most common ankle sprain seen it is definitely a common contender with individuals who are active and participate in contact sports. Treatment for a high-ankle sprain initially consists of R.I.C.E. (Rest. Ice. Compression. Elevation). But once the initial inflammation subsides, it is important to seek the help of a physical therapist for optimal recovery. Ligamentous injuries, such as a high-ankle sprain, take longer to recover than bone injuries such as a fracture. That makes early physical therapy intervention that much more important. Call Castle Pine Physical Therapy at 303-805-5156 today and set up a consultation. Jennifer is ready to work with you to get your ankle back in shape!